So why did we create a blog post about it? Great question! This tool has never been real easy to find. At one point it was linked to within Webmaster Tools (Now Search Console). I only saw that a few times. It was then removed from my understanding. (Still not 100% sure if it is / was there). I decided to reference it within a blog post to make it easier to find it. 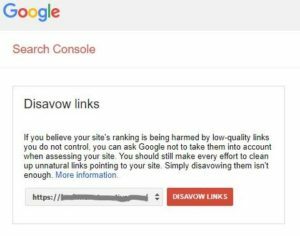 Here is the official Url: https://www.google.com/webmasters/tools/disavow-links-main . We don’t have to disavow links very often for clients, but when we do, this tool is the one to use. Eventually I’d like to write a complete guide to disavowing links, but time is limited and I know there’s quite a few that exist out there already. Here s a good one by Bruce Clay.